I’m a sucker for love so pretty much every day seems like Valentine’s Day. Yesterday Cornelius jokingly said that Valentine’s Day is the day where you have to prove your love to the other person! After laughing, I decided that I’d bake up some proof right away. After seeing Gourmet’s recipe for a Truffle Chocolate Tart pretty much everywhere, I was smitten. Unfortunately, I didn’t have really great dark chocolate at my disposal. I did however have some pretty decent semi-sweet baking chocolate and some really amazing imported French dark dark cocoa. I also had some Callebault white chocolate on hand…so I decided to modify the recipe somewhat and knock me out some love cake. Using 2 different chocolates, I decided to marbleize the ganache and create some pretty looking swirls. And since I was using white chocolate which is quite sweet, I did not add extra sugar to the mix. I’m sure it will be sweet and rich enough without the extra sugar! Truth be told, I haven’t taken a bite out of this tart (we’re saving it for tonight), but every time I lift the lid off my cake dome, I’m instantly salivating from the heavenly chocolate aroma. Oh my! Bring on the love! 1. Make crust: Put oven rack in middle position and preheat oven to 350°F. Wrap a sheet of foil over bottom of springform pan (in case of leaks). Lightly butter side of pan. Stir together ground wafers and butter in a bowl until combined, then pat mixture evenly onto bottom of pan and 1 1/2 inches up side. Bake until crust is slightly puffed, about 10 minutes, then cool completely in pan on a rack, about 15 minutes. Leave oven on. 2. Make filling while crust cools: Whisk together eggs, cream, sugar, salt, and vanilla in a bowl. Divide mixture into 2 even halves. Set aside. Over low heat, melt dark chocolate, cocoa and half the butter in one saucepan and melt white chocolate and the other half of the butter in another saucepan. Stir until smooth and remove from heat. Cool for 5 minutes. Whisk the dark chocolate mixture into one of the egg mixtures and add the white chocolate into the other egg mixture and combine well with a whisk. 4. Cool tart completely in pan on a rack, about 2 hours. Chill, uncovered, until center is firm, about 4 hours. Remove side of pan and serve. * I didn’t have chocolate wafers, so instead I used vanilla wafers and added in a tablespoon or two of dark cocoa. ** It took about 40 minutes for the batter to not be totally liquid. Maybe I just have an old stove. I think that is proof of some heavy duty love…don’t you agree,Cornelius?? Orangette made this cake the other day, too. 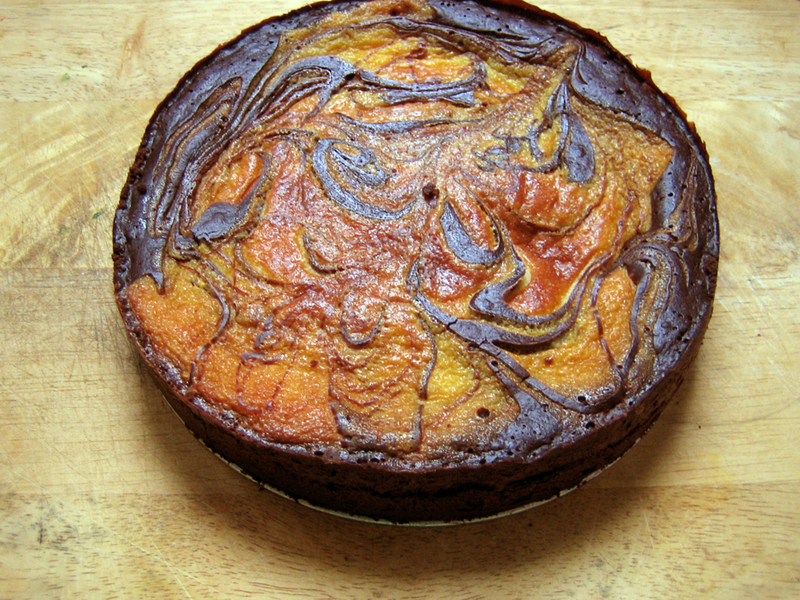 I just made it last night (to enjoy tonight) but your marbled cake looks spectacular! I can’t wait to hear what you thought! It looks decadent and delicious! I was having difficulty getting onto the internet today…maybe it had something to do with the bad winter weather we have been having since yesterday. Your ‘love cake’ looks love-ly. I’ve never had a truffle cake before. Is it a mousse cake or a sponge cake? Or both? Happy Valentine’s Day – hope you have a good one! Ha ha, I just saw that cake on Orangette and immediately printed out the recipe. I have some chocolate cookie crumbs left over from the Very Valentine Torte (http://www.foodtv.ca/recipes/recipedetails.aspx?dishid=7956) I made which was sadly, not a raging success. Oops, I don’t think that link worked. Anyway, if you want to try it, the trick is that you have to buy DOUBLE the amount of ingredients for the white chocolate mousse. The recipe is deceptive. oh my, that looks soooo delish! i think i need to purchase a springform…. Awesome! I’m thinking thats some serious lovin 😉 Looks good!!!! How was it? I made the original Gourmet recipe too! My first take was that it was too chocolately (hard to believe) but a second piece the next day changed my mind. I served it with raspberry coulis for a nice contrast. Jill, I think this is definitely proof…and Cornelius agrees! Anon, I pulled mine out from the oven when the centre was still jiggly and the cake is so smooth and creamy good! Joe, the tart is amazing! And really very easy to make. After seeing what you made yesterday, you could pull this off on a whim! Joanne, it’s more like a very smooth and creamy cheesecake! So yummy. Yup, Cara, a springform is a sweet thing to have around. Jenn, the tart was divine! So rich and chocolately good. Thanks Brilynn, it was my first time making swirls in batter! I’m glad they turned out so lovely. Yes, that’s hard to believe, Alyssa! Too chocolately, no such thing! I also served ours with a raspberry coulis and it was a match made in heaven, indeed! I’ve been on a chocolate kick lately too. Wow – this looks completely awesome! And listen – I want to ask you something. Email me, would you? beth, there is something about valentine’s day and chocolate that goes hand in hand! WOW! What a great little tart! Easy and oh so delicious! My family loved it!